Bacon + Turkey = Easy & Juicy! 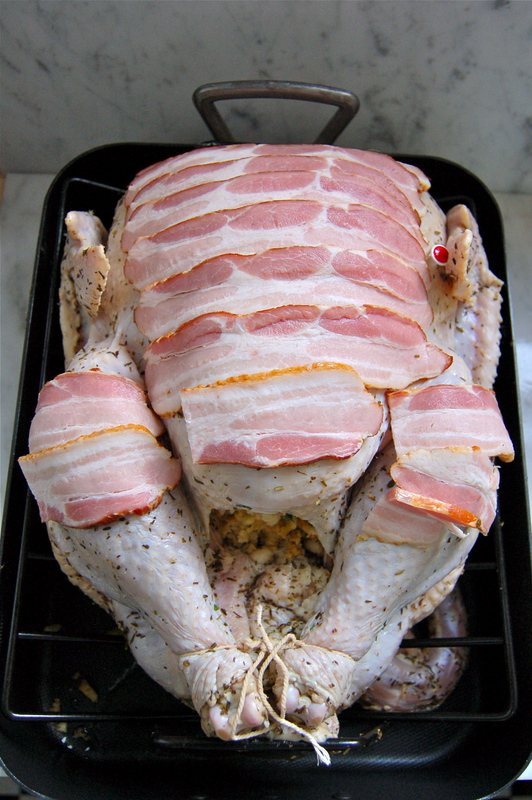 That’s right, I said it: Bacon Wrapped Turkey. 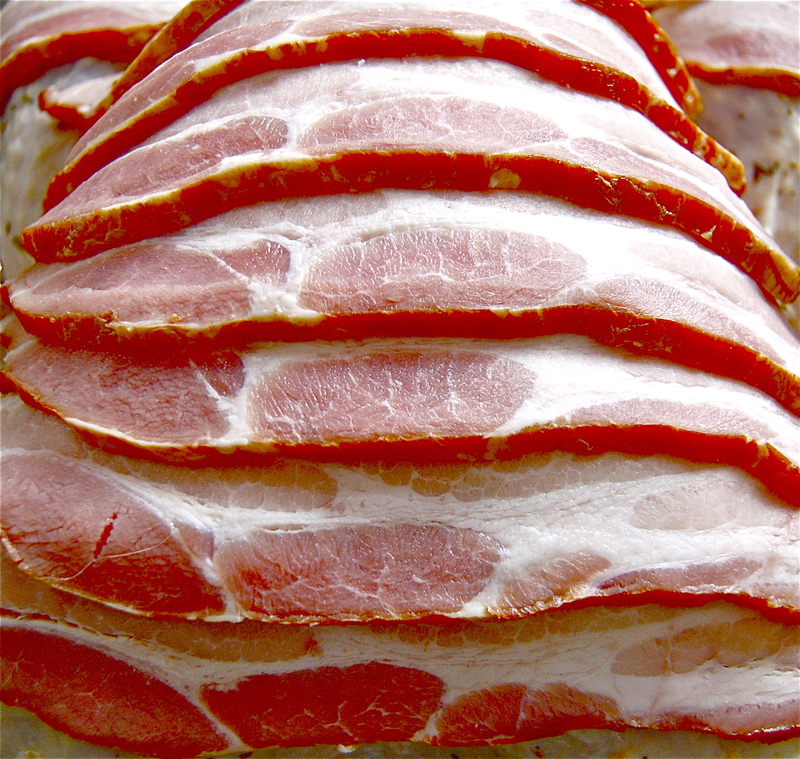 Bacon makes everything better – including Thanksgiving. In-laws driving you crazy? Can’t keep the kids calm while you’re slaving in the kitchen? 49ers getting beat by the Hawks? Turkey getting dry? All of this can be solved by one magical animal I call “bacon”. 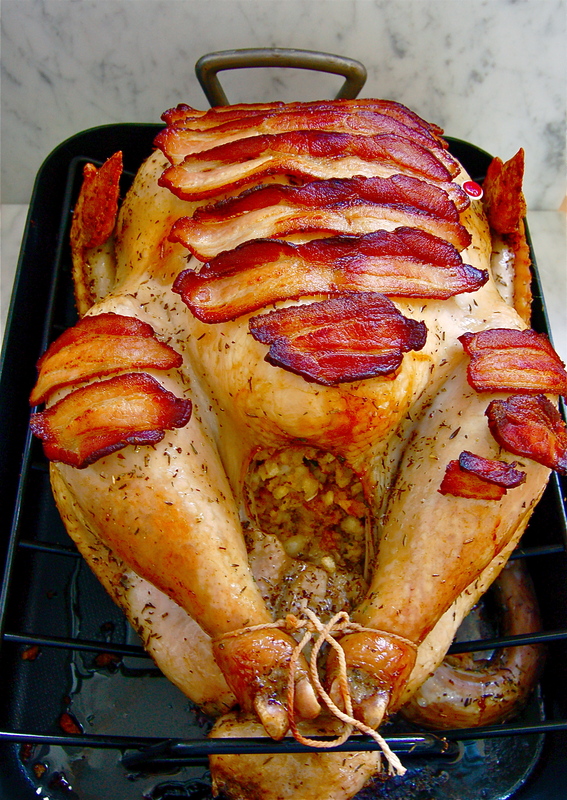 Wrapping a turkey in bacon for most of the cooking time keeps the turkey moist and delicious. And since the bacon is removed for the last hour of cooking, you can enjoy the bacon earlier to solve all those in-law, upset kiddo, 49ers loosing blues. Bacon wrapped, juicy, easy, fool-proof turkey! I don’t now why this isn’t a common turkey roasting concept. Wrapping a turkey in bacon allows fat and flavor to slowly drizzle into the turkey meat for most of of the roasting period. It’s a hassle-free way of keeping your turkey flavored and juicy. For turkey purchasing, I recommend buying a refrigerated, NOT frozen, turkey. Only because I’m too impatient lazy smart to buy a frozen one and defrost it for days. 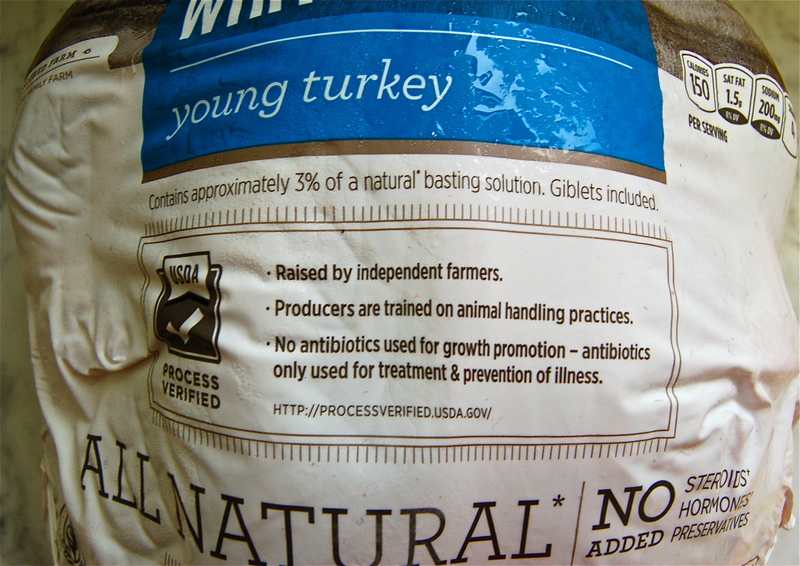 There are a lot of labels on a turkey – range free, no antibiotics, etc. The only one that you should ignore is gluten free – they are all gluten free. The other labels you can buy per your preferences (no antibiotics, vegetarian fed, etc). To prep the turkey, remove any plastic-y looking things holding the legs together. Remove the bag that’s hidden inside under the neck. This bag holds the giblets & neck. 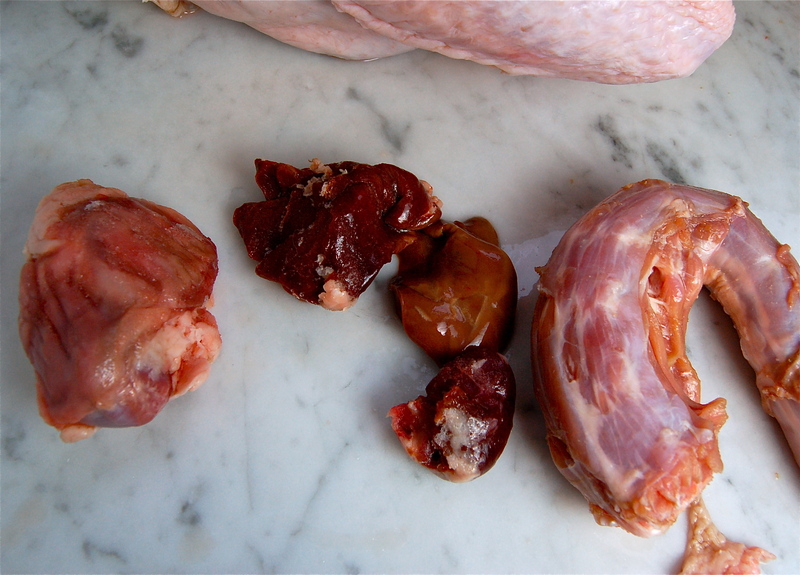 These items can be brined and roasted right along with the turkey then reserved later for stock or gravy. Brining takes overnight to one day to be effective. If you don’t have enough time to brine, season your turkey with salt, pepper, thyme, parsley, sage, and rub skin (including under the breast skin) with butter or olive oil. 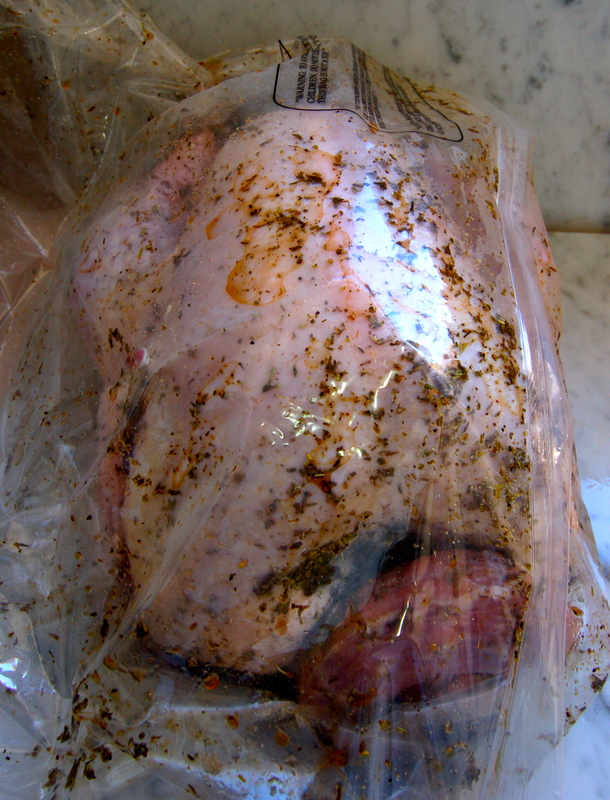 If brining, rub butter over skin, under breast skin and place in a large brining bag. Add brining seasoning and the beer. At this point you can add water to cover the turkey, but this makes turkey + water = super heavy. 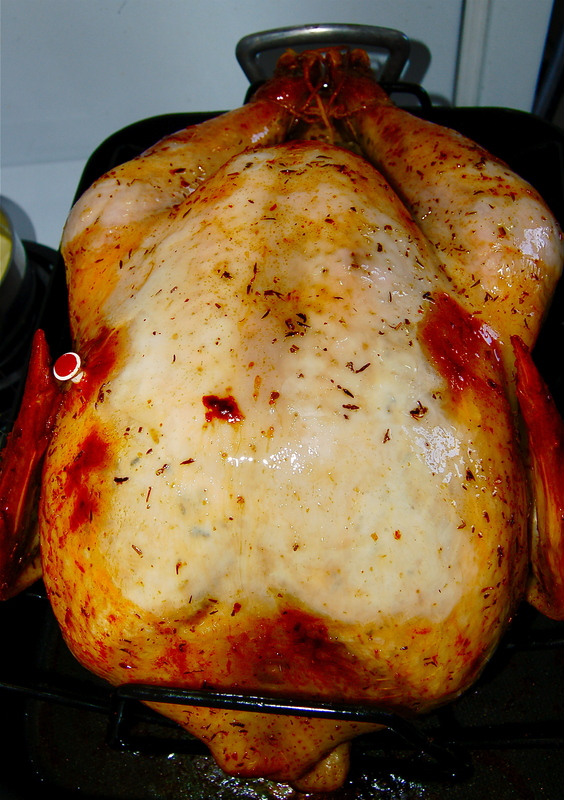 Filling it with water allows all seasoning to cover turkey so there is no need to flip. I don’t add the water and flip every 6 hours. Keep refrigerated overnight to 24 hours. On cooking day, preheat oven to 325 degrees, drain turkey and place on a roasting rack. Stuff cavity of turkey with onion, garlic, lemons and, optionally, stuffing (I used Stove Top). Tie legs together with cooking twine. COVER IN BACON and celebrate a little inside. And now, for some bacon photos. 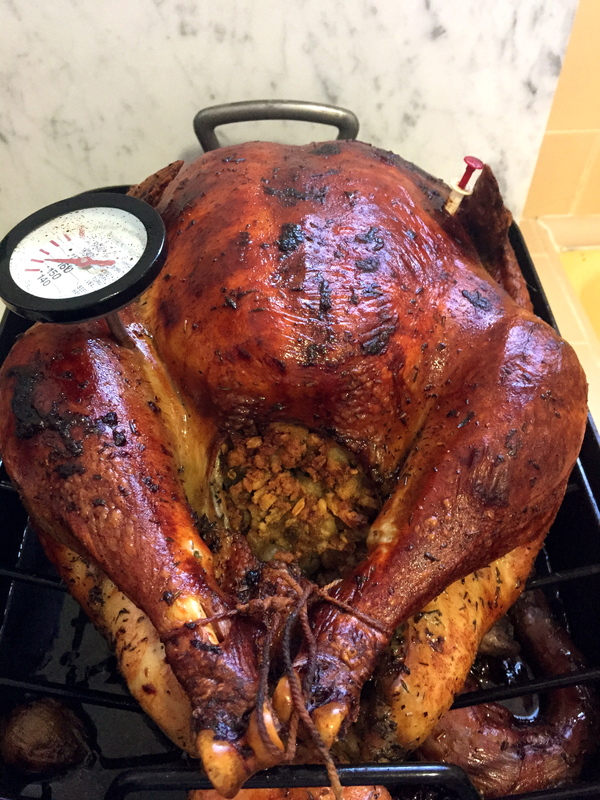 Roast turkey with bacon, basting with drippings from the bottom of the pan every 45 minutes. Roast with bacon until the last hour of roasting. You remove the bacon because it’s fulfilled its usefulness and to make sure you get a beautiful, crispy, brown skin. Cook until a internal temperature of thigh is about 160 degrees. Remove from oven and rest, covered in aluminum foil for 30 minutes. The temperature will raise slightly higher as it rests. 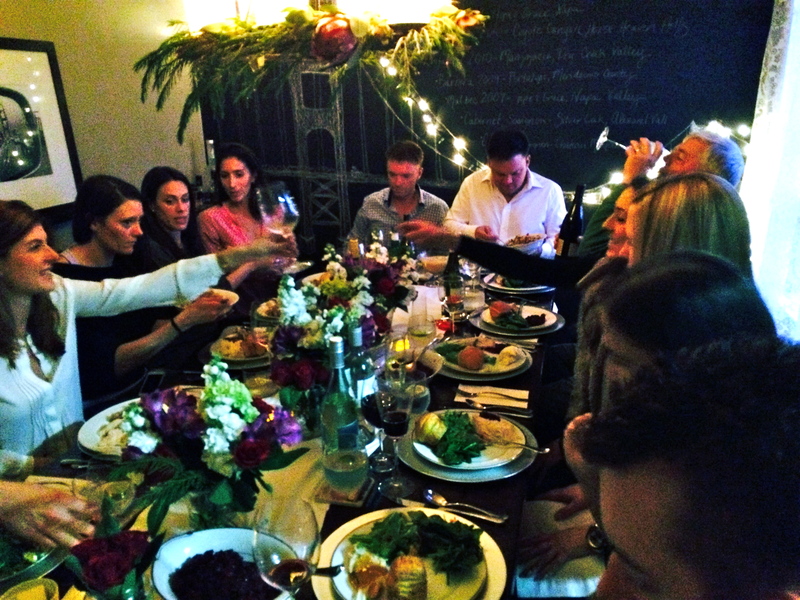 Now have your favorite guest carve the turkey and serve! Don’t forget to set the table pretty, eat some crispy bacon, and enjoy all those happy, smiling, turkey eating guests of yours. Happy Thanksgiving everyone! Cheers to bacon wrapped turkey! I need you to come do my next Thanksgiving! Seriously! I love the way you make cooking fun, my friend! Thanks, Chris! Let me know if you have anything you want me to cook! 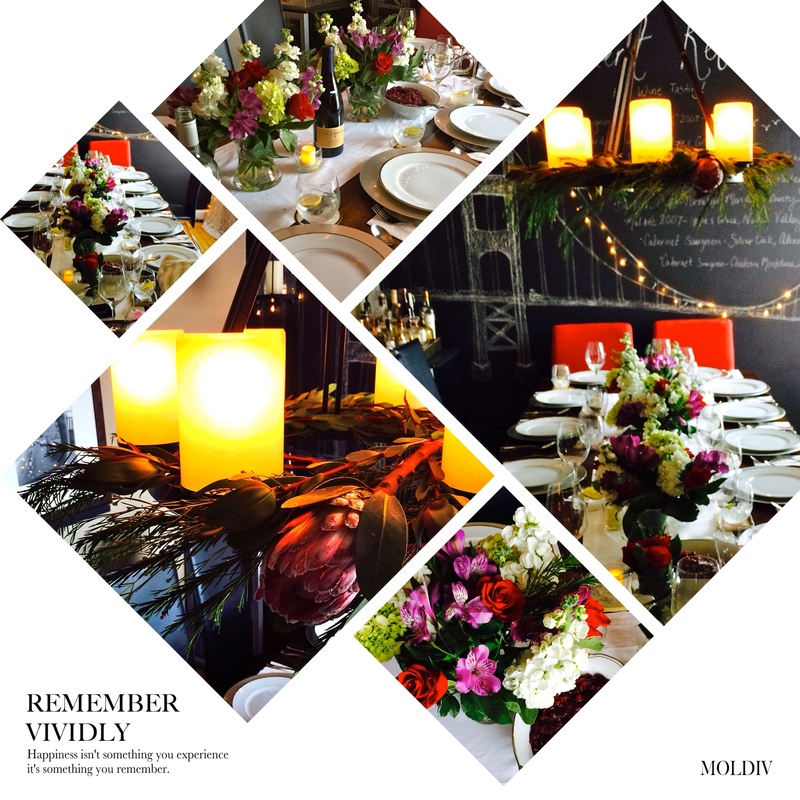 For the site…for you…for parties…just let me know!